Mini corn dogs are a comfort food treat. We know otherwise sophisticated gastronomes who go out of their way to visit hot dog joints that sell corn dogs. A corn dog is a hot dog coated in a thick layer of cornmeal batter, deep fried and served on a stick. While it’s not fried food on a stick, we were attracted to this mini corn dog recipe from PamperedChef.com. It’s good Super Bowl finger food. 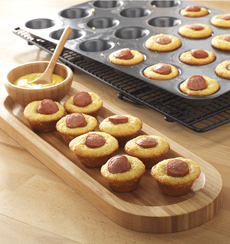 All you need is a box of corn muffin mix, hot dogs and a mini muffin pan. 1. PREPARE the corn muffin batter according to package/recipe directions. 2. PREHEST the oven to 375°F. 3. SPRAY mini muffin pan with nonstick cooking spray. Divide the batter among the muffin cups. 4. SLICE hot dogs into 1–inch pieces. Place one piece in each muffin cup. 5. BAKE 10–12 minutes or until wooden pick in centers comes out clean. When cool enough to touch, remove corn dogs to serving plate. Serve with mustard or dip (we mix Dijon mustard with Greek yogurt). You can buy the pan at PamperedChef.com. Like the hot dog (sausage) in a bun, the corn dog is an American invention, enjoyed plain or with hog dog condiments such as ketchup, mayonnaise, mustard and relish. Food historians note that corn dogs on sticks were around in the 1920s; patents were filed for cooking apparatuses to make them. Various people claim to have invented the corn dog way after then, as popularity grew in the 1930s and 1940s and corn dogs became street fare and county fair fare. But in those regionalized, pre-Internet days, research wasn’t easy, so local entrepreneurs can be forgiven for not knowing that others had been selling corn dogs for years. The best corn dogs are fried just before serving to get that crispy crust. Heat-and-eat frozen versions are available in supermarkets—and we’d opine that Disneyland uses frozen corn dogs (they were bland and uninteresting). Some corn dog purveyors sell these premade frozen corn dogs which have been thawed and then fried again or browned in an oven. If you care, ask before you buy from a vendor (and hope for an honest answer).